I’ve never been on the ridiculous “walking simulators aren’t real games” side of the discussion, but after playing a ton of them it has become clear that what separates the great ones from the rest is that they do, in fact, offer actual gameplay besides just slowly trudging around and listening to a story that already happened. Tacoma, the latest from Gone Home developer Fullbright, leans toward the latter end of that spectrum and the result is a neat story with great presentation, but it doesn’t really engage you the way the best in the genre can because you’re still ultimately just a passive observer. Still a more than worthwhile experience for walking sim fans, but it won’t change anyone’s mind about the genre. Continue reading our full Tacoma Xbox One review for all of the details. You play as Amy Ferrier, a subcontractor sent to the Tacoma space station to investigate an accident and recover A.I. data and hardware. The six-person crew is gone but key moments of their lives – particularly over the last few days – are available as augmented reality recordings. As in every walking simulator, learning about the individual crewmembers and their relationships is as much the draw here as learning about the accident aboard the station. Watching the AR recordings, reading their conversation logs, and checking out their personal living quarters all help turn the crew – represented as brightly colored polygonal projections – into real living, breathing, relatable people. 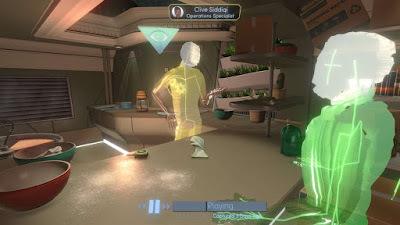 Gameplay takes place in the first-person-perspective where you (sigh) walk around and look at stuff and activate conversations. Tacoma makes things slightly more interesting since the conversations are actually augmented reality recordings. The AR recordings of the crew cover an entire area of the station so you might have to follow people around to get the full details of a conversation or even play through a recording multiple times since multiple conversations can be taking place in different rooms all at the same time. You can freely rewind and fast forward through scenes as well as pause them so you can peep through a person’s data when they have it open at that moment during a scene. The core idea is that you have to collect 100% of that vital data in each area of the station in order to move on to the next. Vital conversations are marked on the timeline of each scene, so figuring out who you should be following and paying attention to is easy. You don’t actually have to listen to every conversation or look at every log / etc. to make progress, but being thorough in your exploration and attentive in your observation helps flesh out the characters. The various scenes take you through the planning stages of a party, an accident where the station suddenly loses oxygen, the desperate struggle to come up with an escape plan and, ultimately, the discovery of what was behind the accident in the first place. Piecing together the lives of the crew before and during the event is fascinating. I can’t help but feel it is overly brief, however, as it only takes a couple of hours to play through Tacoma. Just when you’re barely getting to know the characters and figure out the situation the credits are already rolling. Gone Home felt like you went through a complete journey as you explored the house. Tacoma just sort of hits a climax and immediately ends. I feel like Tacoma needed more to do, too. Coming back to a straightforward “watch conversations”-style walking simulator after playing more active and player involved narrative driven adventures like What Remainsof Edith Finch, Journey, ABZU, RiME, and Firewatch is pretty disappointing. Scouring over every note of paper or e-mail or book on a shelf in order to scrape together enough story that you give a crap about the characters isn’t nearly as interesting as giving you actual gameplay that makes you an engaged participant in the story rather than just an observer. 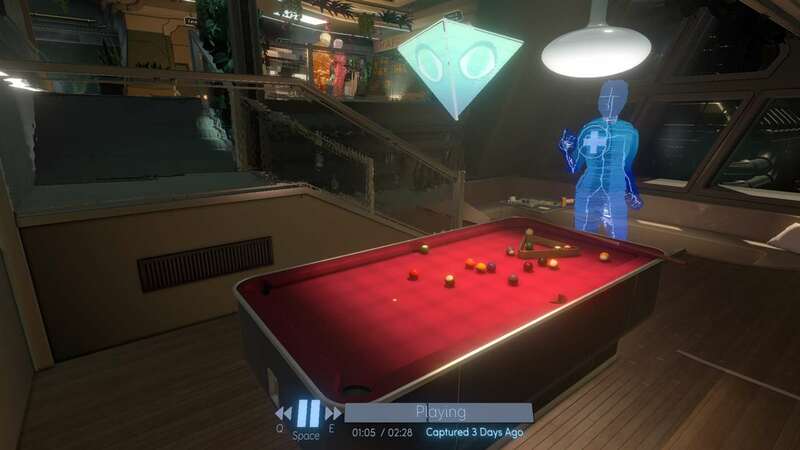 Tacoma is still very enjoyable, don’t get me wrong, but isn’t especially “fun” the way the genre has shown it can be. There are also some performance issues on the Xbox One version of Tacoma that need to be addressed. Many players, including me, experienced the game getting stuck on the menu screen when you first start the game. A hard reset of the Xbox fixed this, but it is still annoying. The game also has frequent framerate issues where the game will noticeably chug along even when seemingly nothing is going on. The worst drops occur during transition scenes where the game is loading in the next area, so it is sort of understandable, but the framerate is unstable during regular gameplay, too, which isn’t as easy to ignore. Presentation overall in Tacoma is fantastic. The visuals are sharp and clean and the little details, particularly in the personal quarters of the crew, are very well done. Something that I noticed is that even though there are windows all over the place, most of them are just looking at the structure of the station rather than a nice view of outer space (though other areas did have better views). This was an interesting detail that helped me imagine the psychological toll of working on the station as much or more than any of the personal diaries did, which I really appreciated. Sound-wise Tacoma is excellent with unanimously great voice work for the crew and an unexpectedly great soundtrack that consists of more than just futuristic techno like most sci-fi games use. 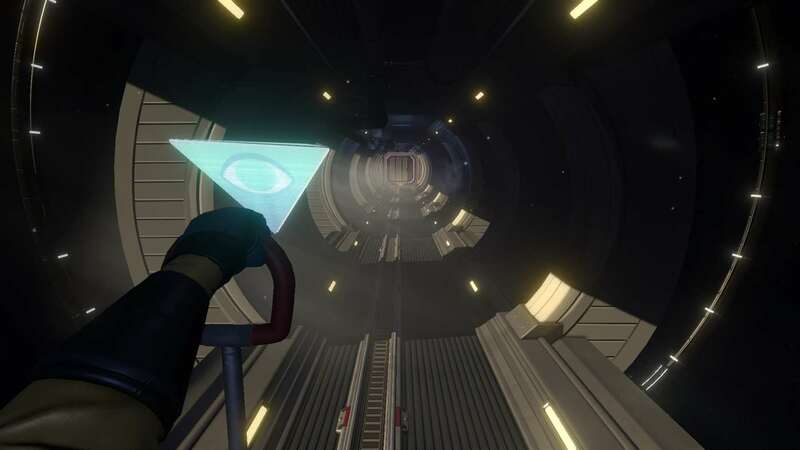 In the end, Tacoma is easily a better game than Gone Home and a solid walking simulator overall. Good presentation, solid story, and a neat storytelling method go a long way here, but the brevity and lack of real meat in terms of interactivity set it back a bit compared to other recent entries in the genre. It won’t do much to sway the opinions of folks that don’t like narrative driven adventures, but for fans of the genre Tacoma is another good one and well worth a look.